J JS Lee came up in the same class as Simone Rocha, Thomas Tait and Matthew Harding (one half of palmer//harding). They emerged at a time when the London scene increasingly spotlighted vibrant young talent and perhaps the timeliness of their arrival cemented the longevity of their careers. It’s been 8 years and all four remain in business. A film by Tezo Don Lee, entitled ‘A Singular Interview’ played on screens. At two and a half minutes, the short film follows a gentlemanly scholar interviewing a pinstripe-clad man. It segues into the young man sitting in a theatre, watching ‘The Late Night Show with Finn.’ Throughout, there is a sense that the subject is boyishly shy, perhaps even nervous but in the final scene he marches confidently down a corridor, suitcase and golf clubs in hand, halting and pivoting to see what is behind him. Wordless exposition is the art of film and one gleans a clear sense of the J JS Lee man from watching the film. One imagines him in a pastoral setting, surrounding by canines at the fireside, reading Hopkins, studying the intricacies of sprung rhythm or perusing the Financial Times—whatever catches his fancy. The clothes are supportive of this claim. Prim and proper like her womenswear, not overly fussy and concerned with a perfunctory charm rather than a gaudy exclamation. But the clothes weren’t as they seemed. 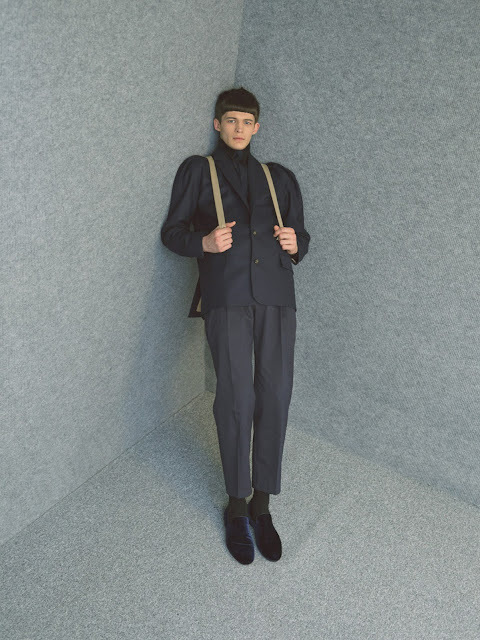 They toyed with traditional lengths and cut—suspenders were built into double-breasted pinstripe suits and created Y shapes on the back; shoulders were enlarged to give a feminine touch; other sleeves were separated from the bodies of jackets, it was one of the more trend-led pieces but it bore a non-conformist edge regardless. 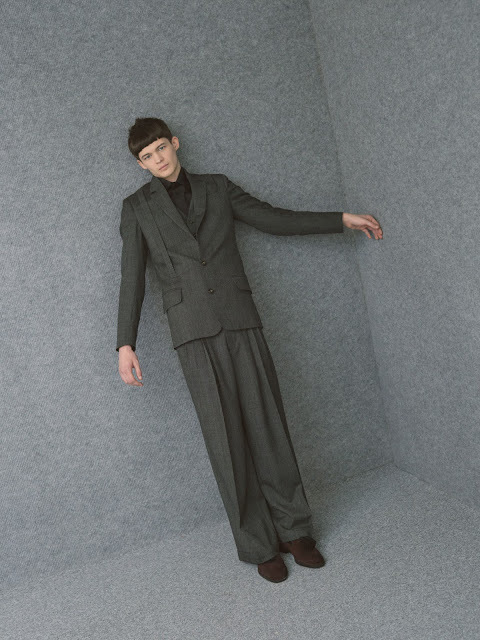 The subtle alterations to the conventional 50s menswear uniform and boxy shapes is seemingly the direction of J JS Lee Man. 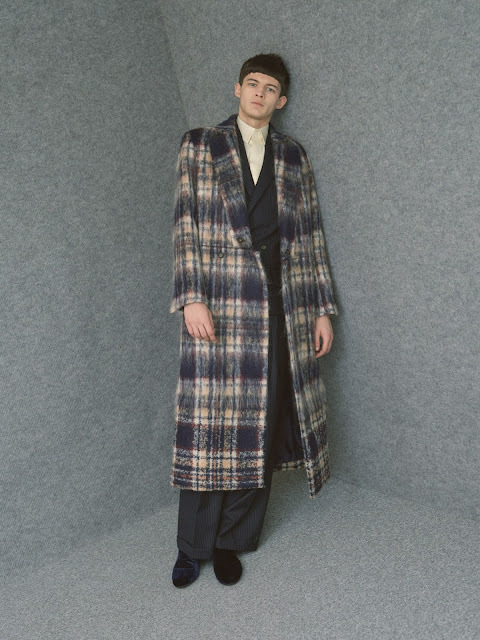 The latest venture from the South Korean designer could perhaps be complemented should she place her menswear in the context of her womenswear. It would be interesting to see the aesthetic and perhaps solidify the aesthetic of the world in the way Margaret Howell has recently consolidated her menswear and womenswear—Lee and Howell are aesthetic bedfellows. Continuing the experimentation with film could be paramount in her success in fashion—truthfully, it worked. It made efficient use of its limited time and captured the crux of her menswear. And it was entertaining.